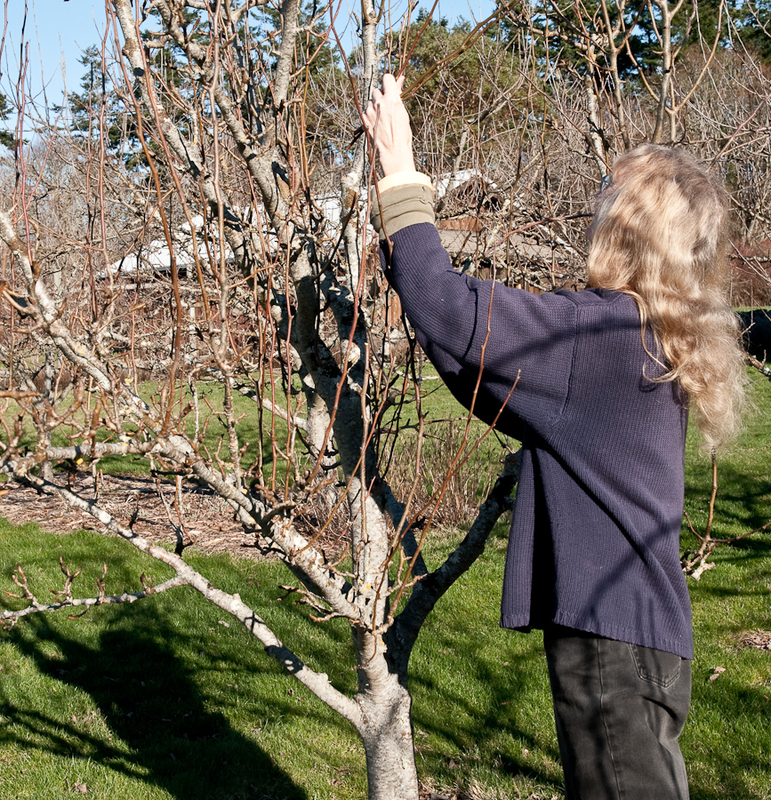 If you’re spending some of these winter days pouring over fruit tree catalogs, imagining new plums and cherries, pears and apples, maybe you should add grafting to your studies. Learning what it is, how it’s done and why people do it may inspire you to graft some new varieties onto your existing trees or start some new trees that strike your fancy. Grafting is the process of joining scion wood—dormant shoots of last season’s growth—to a rootstock: the part that supplies the roots, anything from a small, rooted slip to a fully-grown tree. The result is fruit identical to fruit from the tree that produced the scion wood. When Carol Noyes, a Lopezian passionate about fruit trees, asked if she could come over and take some scion wood from our pear trees, we quickly agreed, eager to learn more about how grafting works. On a recent afternoon Carol arrived with her pruning shears and grafting tools. Gazing up into an Orcas pear tree full of last year’s growth, Carol explained that she was looking for leaf buds, not flower buds. “Leaf buds are flatter,” she added, clipping several pencil width shoots each about a foot long. “You’re fitting cambium—the thin green layer of growing cells just below the bark—to cambium. If it’s a good fit, it will likely work,” she said stretching tape around the graft. Finally, Carol cut off the other end of the scion piece, leaving three leaf buds, and explained that she’d seal this end with Elmer’s glue. “Cambium matching and keeping it from drying out. These are the two big secrets of success.” Gathering up her grafting tool and tape, Carol added that while she uses other tools, like a knife, and other methods of grafting, like side grafting to accommodate thin scion wood and thick rootstock, she’s had the highest success rates when she uses her grafting tool. What is a “grafting tool” and where would I buy one? It is rather expensive but worth is, she said, if you have lots of trees to do.